← Will a Loving God Send People to Hell? Yesterday’s post, Will a Loving God Send People to Hell?” elicited a great deal of response, especially on facebook. God doesn’t desire anyone to be lost. So, he sent Jesus to earth on a recuse mission to die for the sins of the human race. In one the great verses of the Bible Jesus taught what one must do to be saved. This passage is often called “The Great Commission.” It was given to the apostles prior to Jesus’ ascension back to heaven. Consider the simplicity of this charge and what it means to us today. #1 The scope of the mission is world-wide. The saving message is for the whole world. Everyone. Every continent. Every country. Every race. The gospel is for all. 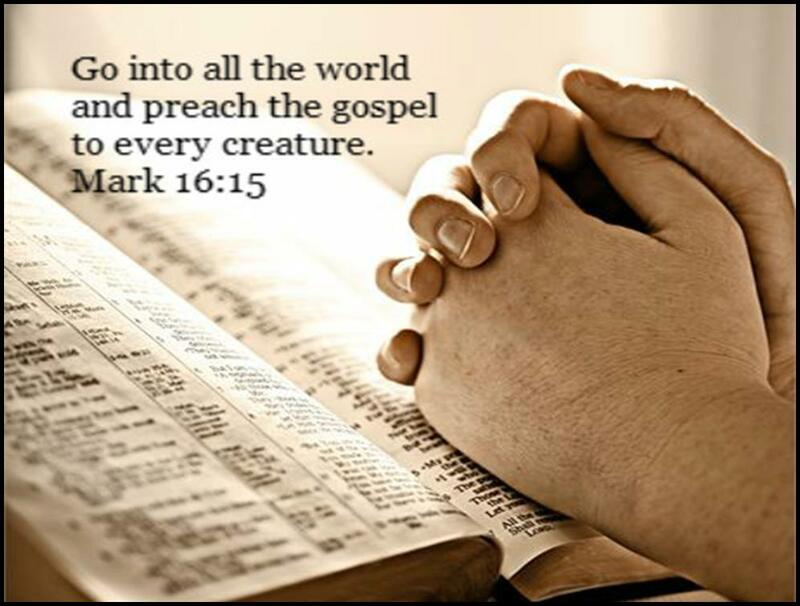 The mission of the apostles, and by application and implication, our mission as God’s people is to preach His Word all over the world. The word gospel simply means “Good News.” 100 times the word is used in the New Testament. It is called “the Gospel of God’ (Rom. 1:1), “the Gospel of Christ” (1Cor 9:12), “the Gospel of the Kingdom” (Matt 24:14), “the Gospel of peace (Eph 6:15), and “the Gospel of your salvation” (Eph. 1:13). #3 To be saved one must obey the Gospel. Faith is an essential element. One cannot truly accept the Gospel message apart from faith. We must believe that Jesus is the Son of God. Believe in His promise. Believe that He will save us from sin. He said, “If you do not you believe that I am He, you will die in your sins’ (Jn 8:24). Of course, faith is not an academic exercise. Faith leads to obedience. Jesus said, “Why call me, Lord, Lord, and do not the things which I say?” (Lk. 6:46). When we really love Jesus we will keep His commandments (Jn 14:15). Indeed, Jesus is “the way, the truth and the life.” No one come to the Father except through Jesus Christ (Jn 14:6). Baptism is also central to the Gospel message. In both Mark and Matthew’s account of the Great Commission Jesus taught that Baptism an essential element of salvation. Baptism is for the remission of sins, Peter taught on Pentecost (Acts 2:38). Baptism puts us into Christ (Gal. 3:26-27). Baptism inducts us into the Body of Christ (1 Cor. 12:13). Baptism is symbolic of the death, burial and resurrection Christ (Rom. 6:1-6). We are baptized into the death of Christ, and there God washes away our sins by the blood of Christ (Rev. 1:5; Ax 22:16). No one needs to be lost. God doesn’t want anyone to perish. He wants all people, everywhere to be saved. The message is simple. But commitment to Christ demands a change in attitude, action and lifestyle. Come to Christ. Obey the gospel. Be saved. Before it’s too late. The message is crystal clear! Jesus is Lord.